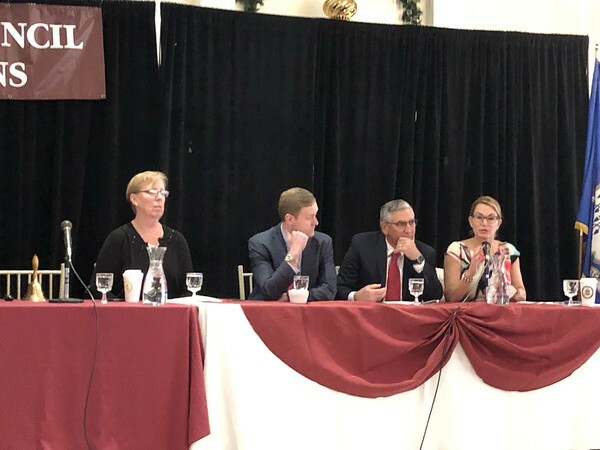 SOUTHINGTON - Several members of the General Assembly took some time away from the Capitol Wednesday to give the Connecticut Council of Small Towns an outlook on the upcoming session. State Sens. 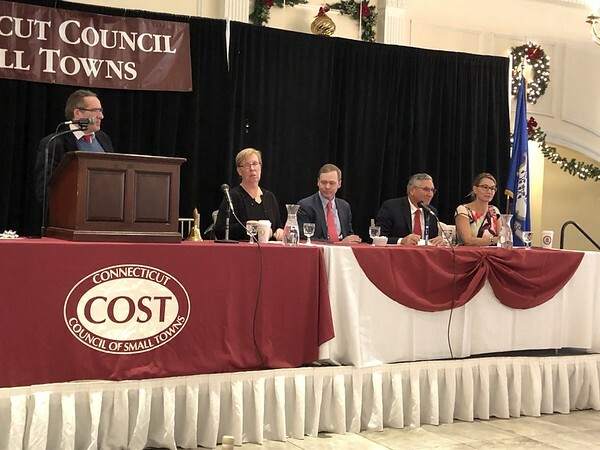 Cathy Osten, D-Sprague, and Len Fasano, R-North Haven, and state Reps. Matt Ritter, D-Hartford, and Themis Klarides, R-Derby, answered questions from a moderator during COST’s annual meeting at the Aqua Turf Club. Much of the discussion centered on upcoming budget discussions and how to make teacher pension plans manageable over the long haul. “You guys do it better than we do, and you do it more efficiently and you do it more effectively,” Klarides said told the town officials in attendance, comparing town budget processes to their state counterparts. Klarides, the House Republican leader, said she’d like to require the state to finalize its budget by April 1 so towns have a chance to look at municipal funding projections before they formulate their own budgets. The state now shoots to have its budget done by the first week of June, but many municipalities begin their budget discussions well before that. Ritter disagreed with Klarides, adding that April 1 is too early for an accurate budget. The House majority leader said some municipalities should look to push back their budget talks to give more time for the state to finalize its numbers. “April is too important. The income tax is too important to state revenue projections for us ever to tell people April First what to do,” Ritter said. Osten said a good way to make budget season more bearable for municipalities is increasing transparency between city halls and boards of education. “This is a transparency issue to give municipalities an ability to look at board of education spending, what’s going on, so that they can have further predictability on the issues and have more cohesiveness between boards of education and boards of finance,” Osten said. When the conversation shifted to teacher pension plans and funding for the Teachers’ Retirement System, Osten said the legislature has “a lot of work to do” to stabilize the model. She compared teachers in Greenwich and New Britain to show the disparity. This salary disparity makes it harder for the state to rectify the pension situation. All four legislators said they don’t support revisiting a proposal made last year by then-Gov. Dannel Malloy that would shift one-third of teacher pension costs to municipalities. Fasano said it would be irresponsible to pass the problem down to the cities and towns. “We need to own it, take responsibility for it, and as leaders and chairmen of committees, we need to figure it out and solve the problem amongst ourselves, because we created the problem, not pass it onto you guys,” Fasano said. On the state’s car tax cap, Klarides and Fasano said the measure isn’t fair to many municipalities. Fasano said he’d like to get rid of the car tax, but there needs to be another revenue stream to make up for that loss. Ritter and Osten agreed the tax has its problems, but Ritter said it would be “tricky” to get rid of. There were several presenters at the Aqua Turf on Wednesday, including the Connecticut Mirror’s Keith Phaneuf. Phaneuf spoke about Connecticut’s rainy day fund and how ready the state is for a recession. Phaneuf also talked about the state’s emphasis on saving money in the coming years - and its legal obligation to do so - and how that could affect funding allocations to municipalities. COST also elected a new slate of directors and officers Wednesday, handed out several awards and outlined its legislative goals and priorities for the General Assembly’s 2019 session. Posted in New Britain Herald, Southington Herald, State on Wednesday, 16 January 2019 20:46. Updated: Wednesday, 16 January 2019 20:49.